Craig McAllister expects Gosport Borough to come out fighting against Weymouth at Privett Park on Tuesday night (7.45pm). 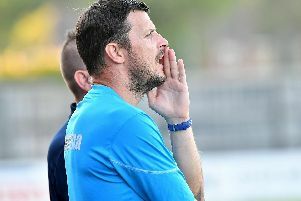 Borough dropped into the bottom three of the Southern League premier division south after their disappointing 2-0 home defeat against Farnborough. In McAllister’s eyes the players need to recognise that they are involved a relegation dogfight. He remains confident they can get themselves out of trouble but must raise their game to do so. 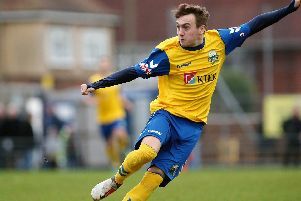 The Gosport boss said: ‘There can be no excuses, we have to be prepared to fight every minute of every game. ‘We have good technical ability in the side but have to earn the right to play our football. ‘It is important we go back to doing the basics correctly. ‘By doing that we can cut out the mistakes which are costing us. ‘We have to remain positive because if we don't then we will end up getting relegated. ‘All of us have to step up because we are playing for our futures at the football club. ‘Weymouth are a top side and stand a good chance of winning the league. ‘We surprised them at their place earlier in the season and must look to do the same again. ‘It depends very much on which Borough team turns up. ‘When we beat them last time we went into it on the back of a home defeat against Dorchester. ‘We do seem to raise our game against the better teams in the league. ‘That won't be enough to keep us in this league. The home side are boosted by the return of central defender Sam Roberts from injury. Roberts has been suffering with a groin problem but has been given the go ahead to play. McAllister admits he has been a big miss for them in recent games. The Borough player boss added: ‘Sam is a dominant strong tackling defender which is something we have missed lately. Borough will certainly need to stay strong at the back against the in-form visitors. The Terras had an excellent 4-3 win at Salisbury and need another three points to maintain pressure on the top two. At the same time they will arrive intent on gaining revenge for the defeat in the first meeting. McAllister said: ‘We won the first meeting by working hard and getting in their faces.